1. Turn the ignition switch to LOCK (0). 2. Release the clamp (A), then disconnect the wheel speed sensor connector (B). 3. Remove the bolts and the wheel speed sensor (C). 4. 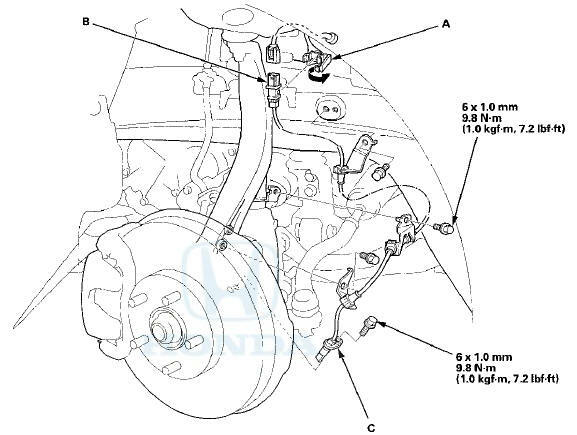 Install the wheel speed sensor in the reverse order of removal, and note these items: - Do not twist the sensor wires. - If the wheel speed sensor comes in contact with the wheel bearing, it is faulty, - Make sure there is no debris in the sensor mounting hole. 5. Start the engine, and make sure the ABS and the VSA indicators go off. 6. Test-drive the vehicle, and make sure the ABS and the VSA indicators do not come on. 3. Remove the clamps, the bolt, and the wheel speed sensor (C). 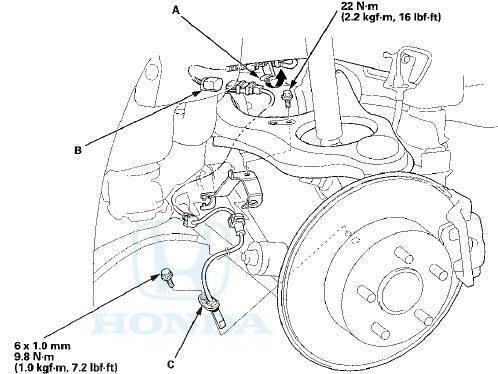 - If the wheel speed sensor comes in contact with the hub bearing unit, it is faulty. - Make sure there is no debris in the sensor mounting hole.